What decisions on strengthening EMU and the ESM were taken at the Euro Summit in December 2018? The heads of state and government of the 19 euro area countries endorsed a package of proposals on deepening Economic and Monetary Union (EMU) at the Euro Summit on 14 December 2018. The proposals included the introduction of the common backstop for the Single Resolution Fund (SRF), to be provided by the ESM, as well as the further development of the ESM’s financial assistance instruments and the role of the ESM. Also, the Euro Summit endorsed an agreement between the ESM and the European Commission on the cooperation between the two institutions that strengthens the ESM’s role. The package of proposals had been agreed by the euro area finance ministers at their Eurogroup meeting on 4 December 2018. Enhancing the role of the ESM is not a goal in itself. It is a means to strengthen the euro area and to make it better prepared to weather future crises. What is the common backstop? The Single Resolution Fund (SRF) is a fund established by the EU in the context of Banking Union for resolving failing banks. It is financed by contributions from the banking sector, not by taxpayer money. In the event that the SRF resources are not sufficient, the ESM can act as a backstop and lend the necessary funds to the SRF. If non-euro area Member States join the Banking Union, the ESM and non-euro area Member States will together provide the common backstop to the SRF, through parallel credit lines. How will loan disbursements from the ESM to the SRF be decided? Disbursements under the common backstop will be approved by the ESM Board of Directors, consisting of high-level officials from the 19 euro area finance ministries, by mutual agreement. Procedures will be in place so that such approval can be made swiftly and efficiently (in as little as 12 hours), in strict confidentiality because of the sensitive data. ESM Members’ national constitutional requirements, including the involvement of parliaments in some ESM Members, will be fully respected while ensuring due confidentiality. How will the common backstop be used? The common backstop will cover all possible uses of the SRF. Further work is needed to find solutions for cases when a resolved bank may need funds to continue operating the next day. This "liquidity provision in resolution” issue will be discussed further in 2019. There should be reporting by June next year. Can the common backstop be introduced before 2024? The common backstop can be introduced earlier than 2024 provided that banks make sufficient progress in reducing their exposure to risks, notably non-performing loans. This assessment will be made in 2020. The criteria for which risk reduction will be measured can be found in the “Term sheet on the European Stability Mechanism reform” (p.2, footnote 1). When will the common backstop be in place? The common backstop will be in place at the latest in 2024. The size of the credit line will be aligned with the SRF funds, which by then will be around €60 billion, or 1% of covered deposits in the Banking Union. If the credit line is used, the SRF will pay back the ESM loan with money from bank contributions within three years, although this period can be extended by up to another two years. As a result, it will be fiscally neutral over the medium term. What happens if a country does not comply with the PCCL eligibility criteria? If a country does not comply with all the stricter PCCL criteria then it can apply for an ECCL under certain policy conditions, which are wider-ranging. The requesting country has to sign a Memorandum of Understanding (MoU) committing to comply with the eligibility criteria, which it met at the time of the request, and in addition to the required reforms. The Member State also faces “enhanced surveillance” under the EU framework. Under a PCCL, “enhanced surveillance” would only apply if the country actually draws on the credit line. How will the PCCL work after the agreed reform? The eligibility process will be made more transparent and predictable. The PCCL is available to an ESM Member whose economic and financial situation is fundamentally sound but which could be affected by an adverse shock beyond its control. The requesting country has to meet a number of criteria to be able to access the credit line and needs to sign a Letter of Intent committing to continue to meet the criteria. Compliance with the criteria is assessed at least every six months. As a rule, Member States need to comply with the EU fiscal rules. That includes having a deficit below 3% of gross domestic product and meeting the debt benchmark (having a debt to GDP ratio below 60% or a reduction in this ratio of 1/20th per year). They cannot have excessive imbalances or be subject to the Excessive Deficit Procedure, and government debt needs to be considered sustainable. Why are precautionary credit lines needed? A precautionary credit line works like an insurance policy. A credit line is made available to a euro area Member State. The baseline assumption is that the availability of the money alone will be sufficient to calm market worries and that no disbursement will be needed. In other words, precautionary credit lines intend to prevent small crises from turning into big crises that would make it necessary for the Member State to ask the ESM for an ESM loan with a full economic adjustment programme. The International Monetary Fund (IMF) also has precautionary credit lines and several countries have used them successfully recently. What precautionary credit lines are available? Two types of credit lines are available in the ESM toolkit: a Precautionary Conditioned Credit Line (PCCL) and an Enhanced Conditions Credit Line (ECCL). The agreed reforms are meant to make them more efficient. What role can the ESM have in debt restructuring? When appropriate and if requested by the Member State, the ESM may facilitate the dialogue between the country and private investors. The constant contact the ESM already has with key players in the euro area sovereign debt markets makes the ESM well placed for this role. The ESM’s involvement would take place on a voluntary and informal basis. What are single limb collective action clauses (CACs)? They are legal rules for sovereign bonds that make debt restructuring more orderly and predictable. They reduce the creditor holdout problem, which can emerge if a small group of bondholders decide not to take part in the restructuring, forming a minority to block it, in the hope of getting a better deal for themselves. These “holdouts” can result in delays in resolving the crisis. With the single limb CACs this will be less likely to happen – if enough bondholders vote in favour, the proposal is approved and applies to all bonds. The finance ministers of the euro area want to introduce these rules by 2022 and to include this commitment in the ESM Treaty. What will change in this cooperation? Going forward, the ESM will have a stronger say in the preparation and monitoring of future adjustment programmes. The ESM will be more involved in the design of policy conditionality as any future MoU will be signed by both, the Commission and the ESM. The Commission and ESM would jointly prepare the financial stability, financing needs, and debt sustainability assessments required to agree on new programmes. In cases where the ESM and the Commission do not agree on the debt sustainability analysis (DSA), the Commission would be responsible for the overall DSA assessment, while the ESM could assess the country’s ability to repay the ESM loan. Why was there a need to discuss cooperation? When the ESM and its temporary predecessor, the EFSF, were set up their main task was to raise and disburse the money necessary for the rescue loans by issuing bills and bonds on the financial markets. Over time, the ESM has taken on additional responsibilities. With the ESM programme for Greece, the ESM has become involved in policy related issues and has worked closely in particular with the Commission, but also with the European Central Bank (ECB) and the IMF. The current cooperation with the Commission has been reflected in a joint MoU signed in April 2018. In November 2018, the Commission and the ESM agreed on a joint position with regard to their future cooperation. What are the next steps in the EMU reform? By spring 2019, progress should be made on the Capital Markets Union. Also, a high-level working group will work on the next steps toward a European deposit insurance scheme and report on progress by June 2019. What has to happen to complete this ESM reform? The euro area finance ministers will prepare the necessary amendments to the ESM Treaty by June 2019. After that, the revised ESM Treaty will have to be ratified by all 19 ESM Members, which will require involvement of national parliaments. What is the total amount of loans that Greece received over the three programmes? The total amount disbursed by the EFSF and the ESM to Greece is €203.7 billion. How were the funds used by Greece? Why was bank recapitalisation part of the Greek ESM programme? Due to political uncertainty and fear of a Greek euro exit, deposit holders withdrew significant funds from Greek banks in 2015, and the banks experienced an increase in payment delays as borrowers waited to see whether the government would introduce debt relief measures. Under the programme, the ESM committed up to €25 billion to Greece to address potential bank recapitalisation and resolution costs. In December 2015, the ESM disbursed a total of €5.4 billion to the Greek government for the recapitalisation of Piraeus Bank and NBG. What kind of reforms have been implemented in Greece? What potential measures were announced by the Eurogroup in May 2016? In its statement of 9 May 2016, the Eurogroup informed that a package of debt measures for Greece could be phased in progressively, as necessary to meet the agreed benchmark on gross financing needs and subject to the conditionality of the ESM programme. The Eurogroup said it would consider short-, medium- and long-term debt relief measures, but nominal debt haircuts were excluded. What were the short-term debt-relief measures implemented by the EFSF and ESM in 2017? Waiving the step-up interest rate margin for 2017 on an €11.3 billion EFSF loan tranche (margin of 2% had originally been foreseen). Thanks to these measures, Greece’s debt-to-GDP ratio will be reduced by an estimated 25 percentage points until 2060, and Greece’s gross financing needs will be lower by an estimated 6 percentage points over the same period. What are the medium-term debt relief measures agreed by the Eurogroup in June 2018? A further deferral of interest and amortization by 10 years and an extension of the maximum weighted average maturity by 10 years on €96.4 billion of EFSF loans. Measures I and II are subject to compliance with policy commitments and monitoring. The total package of medium-term debt relief measures will reduce the Greece’s debt-to-GDP ratio by an estimated 30 percentage points by 2060, and the gross financing needs-to-GDP ratio by around eight percentage points. This comes on top of the already implemented short-term debt relief measures. Will there be further (long-term) debt relief measures? Based on a debt sustainability analysis (DSA) to be provided by the European institutions, the Eurogroup will review at the end of the EFSF grace period in 2032, whether additional debt measures are needed to ensure the respect of the agreed gross financing needs targets. A contingency mechanism on debt could be activated in the case of an unexpectedly more adverse scenario. If activated by the Eurogroup, it could entail measures such as a further re-profiling and capping and deferral of interest payments to the EFSF to the extent needed to meet the gross financing needs benchmarks of 15 to 20% of GDP. What led to Greece’s economic problems? After Greece adopted the euro in 2001, it was able to borrow at much lower interest rates despite its deteriorating competitiveness and public finances. In the decade before the crisis, Greece was able to use this cheap funding to finance a deficit which grew to unsustainable levels. Conditions in the euro area during this period facilitated such lending, despite the build-up of the unsustainable deficit. This meant that Greece could delay difficult structural reforms that had become necessary and may have been unavoidable if cheap funding had not been available during the 2000s. While government spending and borrowing increased, tax revenues weakened due to poor tax administration. At the same time, wages rising much faster than productivity growth undermined Greece’s competitiveness, while low productivity and existing and significant structural problems also contributed to the increasing economic difficulties. As a result, Greece’s economy contracted and unemployment began to climb to alarming levels. Greece’s reliance on external financing for funding budget and trade deficits left its economy very vulnerable to shifts in investor confidence. In 2009, the Greek government revealed that previous governments had been misreporting government budget data. Much higher-than-expected deficits eroded investor confidence, causing the yields on Greek sovereign bonds (which correspond to the cost of borrowing money) to rise to unsustainable levels. The situation worsened to the point where the country was no longer able to refinance its borrowing, and it was forced to ask for help from its European partners and the IMF. What is the Greek Loan Facility (GLF)? The Greek Loan Facility is the first financial support programme for Greece, agreed in May 2010. It consisted of bilateral loans from euro area countries, amounting to €52.9 billion, and a €20.1 billion loan from the IMF. The EFSF, which was only established in June 2010, did not take part in this programme. How is Portugal’s economy performing? Thanks to the implementation of reforms, Portugal has been successful in improving public finances, reinforcing the financial sector and bringing the economy back on a path of recovery. Portugal returned to economic growth in 2014 after four years of recession (1.4% in 2016, 1.8% predicted in 2017). Fiscal adjustment has been significant, with Portugal’s public deficit dropping from over 10% in 2009 to 1.8% (predicted) in 2017. Why did Cyprus need financial assistance? Cyprus’s accession to the EU in 2004 and its adoption of the euro in 2008 contributed to a rapid growth of the financial sector and expansion of bank lending. At its height in 2009, the Cypriot banking sector was equivalent to nine times the country’s GDP, compared to the current ratio of 3.5 times GDP (close to the EU average). In addition, high current account deficits were recorded, and exports dropped due to Cyprus’s falling competitiveness. The banking sector was increasingly cut off from international market funding and Cyprus’s largest banks recorded substantial capital shortfalls against the backdrop of the exposure to the Greek economy and deteriorating loan quality. Bank credit policy, poor risk management practices and insufficient supervision contributed to the problems. The excessive budget deficit limited Cyprus’s ability to help when the banks were on the verge of collapse. What were the policy conditions that the Cypriot government had to implement in order to receive financial assistance? to implement structural reforms to support competitiveness and sustainable and balanced growth, allowing for the unwinding of macroeconomic imbalances. What was the size of the financial assistance programme? The total amount of financial assistance agreed in 2013, in support of Cyprus’s macroeconomic adjustment programme, was up to €10 billion. However, thanks to the rapid economic recovery made by Cyprus, the full amount was not needed. The ESM disbursed €6.3 billion, and the IMF disbursed a further €1 billion. What specific measures were taken in regards to the banks? Cyprus restructured and recapitalised its banks, which are now about half the size they were before the crisis. It has also improved financial regulation and supervision. It has introduced modern insolvency and foreclosure laws to facilitate restructuring of non-performing loans in a cooperative manner. Why were capital controls introduced by the Cypriot authorities? Restrictive measures had to be introduced to protect the financial stability of the Cypriot banking system. This refers in particular to preventing large deposit outflows and preserving the solvency and liquidity of credit institutions. The capital controls were gradually eased and they were fully lifted in April 2015. When did Cyprus return to market financing? Cyprus returned to the bond market in June 2014, when it issued a 5-year bond at a yield of 4.85%. Just one year earlier, in July 2013, the corresponding bond yield had been almost 14%, which shows how quickly Cyprus regained the trust of investors thanks to the implementation of reforms. How has the Cyprus economy performed since it requested an ESM programme? Cyprus resumed economic growth in 2015 (1.7%) after three years of recession; growth has been strong (2.8% in 2016) and is expected to continue in 2017 (2.5%). The country reduced its public deficit from nearly 6% in 2012 to a surplus of 0.4% in 2016. The oversized financial sector was significantly downsized and restructured. Capital controls and the economic adjustment programme helped stabilise deposits and the liquidity of the banking system. Unemployment has been gradually declining since 2014. Cyprus has returned to market financing and, with a cash buffer of over €1 billion, no longer requires financial assistance. When will Cyprus have to repay its loans? 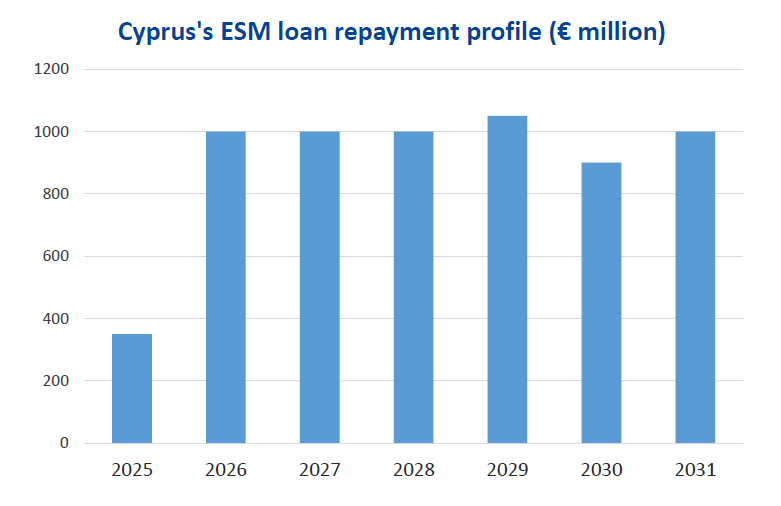 Cyprus will repay the principal on ESM loans from 2025 to 2031. What is the purpose of ESM loans? The main purpose of ESM loans is to provide financing to an ESM Member that has lost market access, i.e. it cannot refinance its debt by issuing bonds on the market due to the excessively high interest that it would have to pay. How are loans linked to reforms? The ESM takes a cash-for-reforms approach. ESM Members receive loans in exchange for economic reforms, called ‘conditionality’. A Memorandum of Understanding (MoU) details the reforms and adjustments to be carried out. How are ESM loans disbursed? Loans are provided in one or more tranches, which may each consist of one or more disbursements. The ESM Board of Directors approves the loan contract - the Financial Assistance Facility Agreement (FFA) - between the ESM and the country, and decides on the disbursement of the first tranche and subsequent disbursements, based on a proposal from the Managing Director. The Board of Directors will have taken into account the European Commission’s report on the monitoring of and compliance by the beneficiary ESM Member with the agreed reforms. How are ESM loans repaid? Each loan tranche has its own specified repayment, or maturity, date. There is always a certain period before the beneficiary ESM Member starts repaying the principal amounts to the ESM. Cyprus will, for example, start repaying its loans in 2025 and Ireland in 2029. Loan interest starts accumulating immediately after the disbursement. Beneficiary countries pay it annually. Can beneficiary ESM Members repay their loans before the agreed maturity date? Yes, beneficiary countries can make early loan repayments on a voluntary basis. The ESM Board of Directors must approve an early repayment, and there may be limitations resulting from changes that would have to be made to the ESM’s funding plans. The beneficiary ESM Member would need to pay certain related costs. What interest rate does the ESM charge? There is no single interest rate on loans for beneficiary Member States. The ESM passes on to programme countries its costs in funding the loans, specifically its cost of borrowing money from financial markets by issuing bonds and bills. This cost is expressed as the ‘base rate’ and is calculated daily. Apart from the base rate, there are three other components that make up the total cost of a loan: a service fee (covering the ESM’s operational costs), margin, and commitment fee. The base rate is by far the largest component of the total interest paid by programme countries. At the end of 2015, the interest rate charged by the ESM was below 1% for all beneficiary countries. As explained, this rate fluctuates according to market conditions. Can ESM loans be given without policy conditions? No, ESM loans are always tied to conditionality. The economic policy conditions are set out in the MoU that the programme country signs. The country and the European Commission on behalf of the ESM negotiate the MoU. What kind of policy conditions do programme countries have to implement? Financial sector reforms – measures to strengthen banking supervision or recapitalise banks. How is conditionality monitored during an ESM programme? The ESM, European Commission, ECB and, wherever possible, the IMF check whether the programme country is implementing the reforms it has agreed to. For this purpose, review mission with representatives of the four institutions periodically meet with the country’s authorities. Disbursement can only be made if the institutions assessment of the reform performance is positive. What are the ways that the ESM can help banks in the euro area? general loan to the ESM Member, under a loan programme, part of which would be used to support the banking sector. Are private investors bailed in before ESM funds are used to rescue a distressed bank? Yes. First, the Bank Recovery and Resolution Directive (BRRD), which is fully applicable as of January 1, 2016, requires the bail-in of at least 8% of total liabilities before any alternative sources of funding can be used to resolve a bank. Second, beyond the requirements of the BRRD regarding bail-in, the guidelines of the bank recapitalisation instrument require a significant bail-in of private investors. What is the purpose of ESM’s indirect bank recapitalisation? Loans for indirect bank recapitalisation help beneficiary ESM Members recapitalise troubled banks, when the country could not afford to and private sector measures including bail-in are insufficient to cover the capital shortfall. Are all banks eligible to benefit from these ESM loans for indirect bank recapitalisation? No, the banks in question must pose a serious threat to the financial stability of the euro area as a whole or to its Member States. What reforms are required in return for indirect bank recapitalisation loans? Unlike loans for a general macroeconomic programme, the conditionality for indirect bank recapitalisation loans focuses only on the country’s financial sector. Reforms typically target financial supervision, corporate governance, and domestic laws relating to restructuring and resolution. Would there be a bail-in of the beneficiary bank’s creditors and shareholders? If the beneficiary bank is solvent, the recapitalisation will be known as a ‘precautionary recapitalisation’. In such case, state aid rules will apply, and the European Commission’s Directorate-General for Competition will decide, on a case-by-case basis, on possible burden-sharing measures. If the beneficiary bank is failing or likely to fail, the rules of the Bank Recovery and Resolution Directive (BRRD) will apply. The resolution authority (the Single Resolution Board, in case of systemic banks and other banks benefitting from ESM assistance) may decide to put the bank into resolution and may restructure the bank, using resolution tools available under the BRRD. Bail-in of creditors and shareholders is one such tool, and the bail-in of 8% of total liabilities is a condition for any public aid (including ESM aid) to be used in the resolution; therefore the bail-in of subordinated debt should be obligatory before any public support (including an ESM loan) is granted. Are the loans for indirect bank recapitalisation disbursed as cash? Loans to ESM Members for indirect bank recapitalisation are generally paid ‘in kind’ rather than ‘in cash’. For this purpose, the ESM issues notes (i.e bills and/or bonds) and transfers them to the beneficiary country, which uses them to inject capital in the distressed banks. The ESM notes are later converted into cash loans. For more detailed information, please consult the ESM Guideline on Recapitalisation of Financial Institutions (PDF, 366 KB). Why is a direct bank recapitalisation instrument necessary? Until the creation of the direct recapitalisation instrument, the ESM could only recapitalise banks indirectly, via the sovereign. In this case, the ESM provides a loan to the government of a euro area Member State. With these funds the government then recapitalises the financial institutions, which is how the ESM provided assistance to Spain. However, such assistance adds to the beneficiary country’s public debt, which could depress market sentiment. This unhealthy link between governments and banks is widely regarded as a crucial destabilising factor for some euro area countries. As a result, the leaders of euro area countries decided in June 2012 to develop an instrument that would allow banks to strengthen their capital position without placing a large burden on the country where the institution is incorporated. How does direct recapitalisation work? Direct recapitalisation means that the ESM would directly inject capital in a bank. This differs from indirect recapitalisation, under which the ESM loans funds to a country whose government then uses the funds to recapitalise a bank. The ESM can directly recapitalise a bank only if it is unable to obtain sufficient capital from private sources, such as a bail-in. The beneficiary institution must also pose a serious threat to the financial stability of the euro area as a whole or one of its Member States. What is the procedure for requesting support? An ESM Member requesting direct recapitalisation should address the request to the Chairperson of the ESM Board of Governors. The request should among others include the possible amount of capital needs, an opinion of the competent supervisory authority on the institution’s financial situation and the result of the most recent stress test. If the institution is not directly supervised by the ECB, then as a precondition for direct recapitalisation, the ESM Board of Governors will request the ECB to take over its direct supervision. The European Commission, in liaison with the ECB and IMF (wherever appropriate) will assess whether the requesting ESM Member meets the eligibility criteria specified in the ESM Treaty and the Guideline on the direct recapitalisation instrument. Likewise, the ESM, in liaison with the European Commission, the competent resolution authority and the ECB in its capacity as the supervisor, will assess whether the institution meets the eligibility criteria specified in the Guideline on the direct recapitalisation instrument. Based on these assessments, the ESM Board of Governors will decide whether the eligibility criteria are met and if so, may decide to grant, in principle, financial assistance for direct recapitalisation. Does the beneficiary institution have to be restructured? Yes. After notifying the European Commission of the intention to grant state aid, a restructuring plan will be drawn up to ensure the viability of the institution after recapitalisation. This plan will be submitted to the European Commission for approval. In parallel, the ESM’s Managing Director, in liaison with the Commission and the ECB, and with the assistance of independent experts, will conduct a due diligence exercise, including a rigorous economic valuation of the assets. Will the requesting ESM Member contribute financially to the recapitalisation? (i) If the beneficiary institution has insufficient equity to reach the legal minimum Common Equity Tier 1 of 4.5%3 (Common Equity Tier 1 is a category of capital consisting of common shares and retained earnings), the requesting ESM Member will be required to make a capital injection to reach this level. Only then will the ESM participate in the recapitalisation. (ii) If the beneficiary institution already meets the capital ratio mentioned above, the requesting ESM Member will be obliged to make a capital contribution alongside the ESM. This contribution will be equivalent to 20% of the total amount of public contribution in the first two years after the Direct Recapitalisation Instrument enters into force. Afterwards, the ESM Member’s contribution will amount to 10% of the total public contribution. The ESM Board of Governors will have the right to partially or fully suspend an ESM Member’s contribution. This refers to exceptional cases when the ESM Member is not able to contribute up-front due to fiscal reasons. Will there be a bail-in or other form of private sector contribution? - a write-down or conversion in full of all unsecured, non-preferred liabilities other than eligible deposits (excluding certain types of liabilities listed in the BRRD). In addition, a contribution from the Member State’s national resolution fund will be made, up to the target level of contributions to the resolution fund as it is defined under the BRRD and Single Resolution Mechanism. What kind of conditionality will apply for the ESM Member and the institution requesting the use of direct recapitalisation and for the beneficiary institution? There will be conditions applying to the recapitalised institution, established under EU state aid rules. In addition, the ESM, in liaison with the Commission and the ECB, can add additional institution-specific conditions. These can include rules on the governance of the institution, remuneration of management and bonuses. Other policy conditions may be related to the general economic policies of the ESM Member concerned. They will be included in the Memorandum of Understanding (MoU) attached to the financial assistance. Can the ESM be a shareholder in the bank it recapitalises? Yes. As a general rule, the ESM will acquire common shares in the bank through the Direct Recapitalisation Instrument. The ESM Board of Governors may authorise the acquisition of other capital instruments, such as special shares, hybrid capital instruments, or contingent capital to fulfil supervisory capital requirements. Can the ESM eventually sell its shares in the recapitalised institution? Yes, the ESM’s participation is temporary. The ESM will actively seek opportunities to sell the investment. The ESM Board of Directors may decide to sell the instruments acquired in full or in tranches. The recapitalisation operation may also be terminated by the redemption or buy-back of capital instruments of the recapitalised institution. Is there a cap on the amount available to recapitalise banks directly? Yes, to preserve the ESM’s lending capacity for other needs, the ESM resources available for direct recapitalisation are limited to €60 billion, out of the ESM’s maximum lending capacity of €500 billion. This also provides transparency for investors and helps preserve the high creditworthiness of the ESM. How does the direct recapitalisation of banks relate to Banking Union? The euro area’s Banking Union consists of a series of mechanisms to strengthen the banking sector in the euro area, including by resolving failing banks. The ESM complements, through its direct recapitalisation instrument, the foundations of the Banking Union - the Single Supervisory Mechanism (SSM), the Single Resolution Mechanism (SRM), and the Single Rulebook. For detailed information concerning eligibility criteria, the procedure for requesting support, the beneficiary country’s contribution, the application of bail-in and other topics, please consult the ESM Guideline on Financial Assistance for the Direct Recapitalisation of Institutions (PDF, 366 KB). Is direct recapitalisation of banks likely to occur in the current setting? When the instrument was first proposed, it was to cut the link between troubled banks and sovereigns. However, it soon became clear that banking union mechanisms could achieve this aim without resorting to the direct recapitalisation instrument. More specifically, the bail-in of private investors, in accordance with the Bank Recovery and Resolution Directive (BRRD), and the contribution of the Single Resolution Fund (SRF), has shifted the bulk of potential financing from the ESM to the banks themselves, along with their investors and creditors. With all the components of Banking Union operational since January 2016, the ESM direct recapitalisation instrument will only be applied as an instrument of last resort, when all other measures, including the bail-in mechanism, have been exhausted. Why are ESM precautionary credit lines needed? ESM precautionary credit lines are designed to maintain access to market financing for ESM Members whose economic conditions are still sound but may come under stress. The credit line prevents crises by acting as a safety net that strengthens the creditworthiness of the beneficiary country, allowing it to issue bonds at lower rates. What type of ESM precautionary credit lines are available? Two types of credit lines are available: a Precautionary Conditioned Credit Line (PCCL) and an Enhanced Conditions Credit Line (ECCL). Both credit lines can be drawn via a loan or a primary market purchase. Both have an initial availability period of one year and are renewable twice, each time for six months. How do these two credit lines differ? A PCCL is available to a euro area Member State whose economic and financial situation is fundamentally sound, as determined by a number of criteria. A beneficiary country would apply for an ECCL if it did not comply with the stricter PCCL criteria. Both types of credit lines require an MoU specifying policy conditionality. However, the policy conditions for an ECCL are wider-ranging. In addition, when an ECCL is approved, the beneficiary ESM Member would face enhanced surveillance. This would only apply to a PCCL if the country actually draws on the credit line. How can a credit line be activated? An ESM Member can activate a credit line on its own initiative. The Member can request the use of the funds at any time during the availability period of the credit line. For more detailed information, please consult the ESM Guideline on Precautionary Financial Assistance (PDF, 180 KB). What is a primary market purchase? The ESM may purchase bonds or other debt securities issued by ESM Members directly from the issuing government in the primary market if there is insufficient demand for such securities. The ESM’s purchase would reduce the risk of a failed auction. It would thus help the beneficiary country finance its debt on the bond market. Which countries could benefit from an ESM primary market purchase? The ESM could purchase such bonds as a complement to regular ESM loans for a programme country or to draw down funds under a precautionary programme. Normally, such purchases would be made towards the end of an adjustment programme to help the country return to the market. Yes, the conditions would be those of the macroeconomic adjustment or precautionary programme. What is a secondary market purchase? The ESM may also purchase bonds or other debt securities issued by ESM Members in the market for previously issued securities, the secondary market, if the lack of market liquidity could push sovereign interest rates too high. An ESM secondary market purchase will increase debt market liquidity and create incentives for investors to further participate in the financing of ESM Members. Which countries could benefit from an ESM secondary market purchase? Secondary market purchases could be provided for ESM Members under a macroeconomic adjustment programme and also for non-programme Members whose economic and financial situation is fundamentally sound, as determined by eligibility criteria. Yes, for countries under a macroeconomic adjustment programme, the conditionality of that programme applies. For ESM Members outside a macroeconomic adjustment programme, an MoU detailing the policy conditions would be negotiated with the ESM Member concerned by the European Commission in liaison with the ECB. How do ESM loans compare to loans of other international financial institutions (IFIs)? The repayment period for loans provided by the ESM (and EFSF) is much longer than loans from other IFIs. For example, the ESM loans disbursed to Greece in 2015 need to be repaid between 2034 and 2059. This is considerably longer than the loans provide by the IMF. The IMF Extended Fund Facility has a maximum repayment period of 10 years. Furthermore, the ESM charges very low interest rates on its loans, because it can borrow money very cheaply thanks to its strong creditworthiness. How do ESM loans save money for programme countries? Without loans from the ESM, the beneficiary countries would be forced to pay high interest rates on the bonds they issue because markets believe they pose a high credit risk. This would place a serious burden on their public finances. Thanks to the low rates the ESM charges, programme countries save significant amounts compared to the cost of issuing bonds themselves. The long maturities of ESM loans also reduce the countries’ financing burden by pushing repayment into the future and extending it over time. How much do programme countries save from ESM lending? The following table shows the savings for all five EFSF/ESM beneficiary countries in 2016 alone as a result of ESM loans vs. the theoretical market cost. Similar savings as a result of the advantageous EFSF/ESM lending conditions can be expected for the years to come. Why is an evaluation of past EFSF/ESM programmes needed? The evaluation of financial assistance programmes, an established practice in international institutions, is designed to improve future ESM crisis management. With the benefit of hindsight, the evaluation will draw up a series of lessons learned which will then inform future ESM programme policies and practices. The timing of this evaluation is also appropriate as four of the five financial assistance programmes granted by the EFSF/ESM, were completed successfully without a need for follow-up arrangements. The evaluation will assess the relevance, effectiveness, and efficiency of EFSF and ESM financial assistance in meeting with the institutions’ overarching goal: safeguarding the financial stability of the euro area and its Member States. The exercise will cover activities relevant to EFSF and ESM programmes for Ireland, Spain, Cyprus, and Portugal. The evaluation period covers the negotiations for each programme and runs through the post-programme period up to end-June 2016. The second Greek programme (EFSF programme) will also be covered but only until the initial expiry date of end-December 2014. This reduced scope is designed to help avoid compromising the current activities of the ongoing third Greek programme (ESM programme). The entire second Greek programme and the third programme could be evaluated after completion in August 2018. What topics will the evaluation address? It will investigate design, financing, and cooperation issues, ensuring it is complementary to, and does not duplicate, other evaluation exercises. It will not, for example, focus on examining certain aspects of programme design – such as conditionality – which fall under the remit of other institutions. The evaluation team will seek to answer a series of questions on the relevance, effectiveness, efficiency of the programmes during the negotiation, programme execution, and post-programme phase. In this context, it will also examine the collaboration among the programme partners and with the beneficiaries. It will not look into the decision-making process of the Eurogroup or other political bodies. Given that the evaluation is designed to generate lessons learned, the report will approach the relevant activities in a cross-cutting manner, identifying potential lessons across the programmes. When will the evaluation be finished and how will the results be used? In spring 2017, one year after the ESM was mandated to conduct the evaluation, the high-level evaluator will report to the ESM Board of Governors, made up of the euro area finance ministers. The evaluator may present a set of recommendations to improve the functioning of the ESM and its programme activities. The report will be made public on the ESM website. The ESM Management Board will ensure that the report’s findings and recommendations are appropriately followed up to improve future programmes. Why was Gertrude Tumpel-Gugerell chosen as the high-level evaluator? The ESM Board of Governors’ Chairperson determined that Ms Tumpel-Gugerell, an Austrian national, is eminently well-equipped for the role, with the appropriate skillset and personal qualities. She has extensive professional experience in economic policy and financial stability, including eight years on the ECB executive board (2003–2011) and, previously, five years as deputy governor of the Austrian central bank (1998–2003). The chairperson, Jeroen Dijsselbloem, stated that she also demonstrates the authority, competence, and impartiality needed for the post. Will the high-level evaluator have an office at the ESM and will she receive compensation for this role? Ms Tumpel-Gugerell will lead the evaluation process, with the support of an ESM evaluation team and external experts who have evaluation experience at other IFIs. She will also have ESM administrative support, but no designated office space at the ESM. Ms Tumpel-Gugerell will receive daily allowances in line with peer institutions. The ESM is the permanent rescue fund set up in 2012 to provide loans to financially distressed euro area countries. The assistance is granted, under strict conditionality, if needed to safeguard the financial stability of the entire euro area and of each euro area country. Is the ESM an EU institution? No, the ESM is an intergovernmental organisation. In 2012, the then 17 euro area countries signed an international treaty creating the ESM. Currently there are 19 ESM and euro area Member States. What is the ESM’s lending capacity? What is the ESM Board of Governors? The Board of Governors is the ESM’s highest decision-making body. It comprises the finance ministers of the euro area countries as voting members (the European Commission and ECB may participate in the Board’s meetings as observers). The Board of Governor’s most important decisions require unanimous agreement, including decisions to lend funds to an ESM Member. Since January 2018, the Board of Governors is chaired by Mário Centeno, who is also the President of the Eurogroup and the Portuguese finance minister. What kind of voting procedure is used at meetings of the Board of Governors? What is the ESM Board of Directors? The Board of Directors consists of high ranking government officials, generally deputy finance ministers, one from each ESM Member. The Board of Directors is responsible for specific tasks specified in the ESM Treaty, such as the approval of loan disbursements, or tasks delegated by the Board of Governors. The ESM Board of Directors is chaired by the ESM Managing Director, currently Klaus Regling. What kind of voting procedure is used at meetings of the Board of Directors? The Managing Director is the ESM’s top executive and legal representative. He/ she conducts the on-going business of the ESM under the direction of the Board of Directors. The Managing Director is appointed by the Board of Governors for five years and may be reappointed once. The current Managing Director is Klaus Regling, who was appointed when the ESM was established in 2012. How does the ESM finance loans to programme countries? To finance its loans, the ESM borrows money from financial markets. This is done by issuing bonds with maturities of up to 43 years, bills (currently with maturities of 3 and 6 months) and other funding instruments. Thanks to its high creditworthiness, the ESM is able to borrow money from the markets at much lower interest rates than those charged to financially distressed countries. Who buys ESM-issued bonds and bills? Financial institutional investors, such as commercial banks, central banks, asset managers, insurance companies, pension funds and sovereign wealth funds buy the ESM’s debt issues. These institutions regard ESM securities as safe investments, thanks to the ESM’s strong financial backing and capital structure. Investors also value ESM securities because they can be sold easily. Is taxpayer money used to finance ESM loans? No, the ESM does not finance its loans with taxpayer money. The ESM raises the full amount of loans by issuing bonds, bills and other instruments. ESM Member States make a contribution to the ESM’s paid-in capital, which is invested conservatively in high quality assets. ESM members’ contributions are therefore invested and never used for lending. Only in the extreme case of a loss can the ESM recur to its paid-in capital. This has never occurred. How much capital does the ESM have? The ESM has a total capital of nearly €705 billion. This consists of over €80 billion in paid-in capital provided by ESM Members and approximately €624 billion in committed callable capital. What is paid-in capital used for? The paid-in capital underpins the financial strength and high creditworthiness of the ESM as an issuer. It serves as a security buffer for the bonds and bills the ESM issues and is not used for lending operations. Paid-in capital is the portion of the ESM’s total capital paid in by ESM Members. The other portion of ESM’s capital is committed but will only be called if needed. How much paid-in capital have ESM Members contributed? The financial contribution of each ESM member to the ESM capital is based on the capital key of the European Central Bank (ECB). It reflects the respective country’s share in the total population and gross domestic product of the euro area. When can ESM Members be asked to pay committed capital? to avoid default on an ESM payment obligation to its creditors. The total amount of committed callable capital is €624.3 billion; each ESM Member’s share of this amount is based on the capital contribution key. Is the ESM’s paid-in capital comparable to other international financial institutions? Note: Amounts for the World Bank and Asian Development Bank converted from USD according to exchange rate of 18 March 2016. How does the ESM invest its paid-in capital? The ESM invests its paid-in capital very carefully, according to conservative criteria in high-quality liquid assets, such as bonds, covered bonds, or secured deposits with minimum rating criteria. The investments are diversified across various asset classes, geographical areas, issuers, and instruments. One of the key objectives of the ESM’s investment policy (PDF, 350 KB) is to preserve the paid-in capital. Does the ESM make a profit? The ESM’s financial result has been positive every year since 2013. Any net income from investment and lending operations is transferred to the ESM’s Reserve Fund, unless the Board of Directors decides otherwise. This is a fund created to cover losses, e.g. if a beneficiary country were to default on a loan repayment. Does the ESM pay its Members a dividend? What exactly does the EWS monitor? The ESM prepares, on a quarterly basis, a payment overview (interest, fees, and principal repayments) for each beneficiary ESM Member, covering the next 12 months. The beneficiary country provides the ESM with a cash flow overview each quarter covering the next 12 months. This overview is sufficiently detailed for the ESM to determine if the country can meet its upcoming obligations. The ESM also considers the implications of the medium and long-term economic and financial outlook for the repayment capability of beneficiary countries. Does the EWS require a mission to the beneficiary country? To avoid duplication and unnecessary reporting burdens on the programme countries, the ESM joins the bi-annual Post-Programme Surveillance missions that the European Commission, in liaison with the ECB, carries out in programme countries. What happens if a repayment risk is detected? If the EWS detects a repayment risk, the Managing Director will inform the ESM Board of Governors and Board of Directors, and will propose possible remedies, such as the creation of provisions and corrective financial measures, if necessary. When does the EWS end for a programme country? Former programme countries will be under the ESM Early Warning System until they repay the full amount of their ESM loan. This ESM monitoring will therefore outlive the post-programme monitoring by the European Commission in the context of the EFSM, which expires when the country reimburses 75% of its financial assistance. Which countries can become Members of the ESM? All euro area Member States are obliged to join the ESM. The ESM was established by the 17 euro area countries in 2012, and since then two additional countries – Latvia and Lithuania – have joined the euro area and became ESM Members. What is the procedure for new euro area Member States to join the ESM? After the decision to adopt the euro is taken for a new country, its government should apply to join the ESM. The technical terms, including the country’s capital share, are agreed and then the ESM Board of Governors approves the application. The new Member State should then ratify the ESM Treaty; this usually takes place about one to two months after the country adopts the euro as its currency. Can the ESM provide loans to countries outside the euro area? No, the ESM provides loans only to ESM Members, all of which are by definition in the euro area. EU countries that do not use the euro as their currency may request assistance from the EU’s Balance of Payments facility. Are new ESM Members required to join the EFSF? No, it is not required. Latvia and Lithuania did not join the EFSF when they became ESM Members. The European Financial Stability Facility (EFSF) was created as a temporary crisis resolution mechanism by the euro area Member States in June 2010. The EFSF has provided financial assistance to Ireland, Portugal and Greece. The EFSF financed these loans by issuing bonds and bills on capital markets. The EFSF is a private company incorporated in Luxembourg under Luxembourgish law on 7 June 2010. The shareholders are euro area countries with the exception of Latvia and Lithuania. Are the EFSF and ESM separate institutions? Yes, they are separate legal entities with different governing bodies and shareholders. However, the ESM and EFSF share the same staff and offices in Luxembourg. How are the EFSF and ESM different? How much financial assistance has the EFSF provided? Can the EFSF still provide loans? No, since July 2013, the EFSF may no longer grant new loans. The ESM is the sole and permanent mechanism for responding to new requests for financial assistance by euro area Member States. Will the EFSF continue to operate? roll over outstanding EFSF bonds, as the maturity of loans provided to Ireland, Portugal and Greece is longer than the maturity of bonds issued by the EFSF. Do EFSF countries guarantee the loans provided by the EFSF? No, the EFSF country governments guarantee only the bonds issued by the EFSF, up to a total amount of €724.47 billion, according to the contribution key in the table below. The issuance of EFSF guaranteed debt is limited to a maximum principal amount of €241 billion. Notes:* The amended contribution key takes into account the stepping out of Greece, Ireland, Portugal and Cyprus as guarantors. What is the EFSF guarantee contribution key? Notes: * The amended contribution key takes into account the stepping out of Greece, Ireland, Portugal and Cyprus as guarantors. The CEO of the EFSF is Klaus Regling, who is also Managing Director of the ESM. What is the EFSF Board of Directors? High-level representatives of the 17 EFSF Member States (deputy ministers, secretaries of state or director generals of national treasuries) represent their countries in the EFSF Board of Directors. The European Commission and ECB each have observers on the Board. The current Chairman of the EFSF Board of Directors is Harald Waiglein, the Director General for Economic Policy and Financial Markets at the Austrian ministry of finance. In what currencies does the ESM issue? The euro is the ESM’s main currency of issuance. In October 2017, the first US dollar denominated bond was launched, in order to broaden the ESM’s investor base. The ESM plans to build up a dollar yield curve with standard two-, three- and five-year maturities with a minimum of one to two benchmark deals each year. The ESM runs no currency risk through the USD issues, as the proceeds are swapped back into euros. In what currencies does the EFSF issue? The EFSF only issues in euros and this is not envisaged to change in the future. How are ESM securities rated? The ESM’s long-term debt is rated AAA by Fitch and Aa1 by Moody’s. The short-term rating is F1+ (Fitch) and P-1 (Moody’s). How are EFSF securities rated? The EFSF’s long-term debt is rated AA by Standard & Poor’s and Fitch, and Aa1 by Moody’s. The short-term rating is A-1+ (S&P), P-1 (Moody’s) and F1+ (Fitch). What is the funding strategy of the ESM and EFSF? The ESM and EFSF apply a diversified funding strategy, i.e. they use a variety of instruments and maturities to ensure the efficiency of funding and continuous market access. One feature of this strategy is that funds raised through various instruments are not attributed to a particular country. The funds are pooled and then disbursed to programme countries. The ESM applies two such pools: a short-term and medium-to-long-term funding pool. What funding tools do the ESM and EFSF apply? The ESM applies capital market and money market instruments. Capital market tools include benchmark bonds with maturities ranging from one year to a maximum of 43 years for the ESM, and a maximum of 38 years for the EFSF (the longest loan maturity being the limit). The ESM may hold its own bonds for a limited amount, so that additional funding may be raised by selling the bonds on the secondary market or by using them as collateral in the secured money market. As a supplement to the regular benchmark bond programme, the ESM may issue N-bonds and promissory/registered notes. The ESM issues bills through regular auctions and may also engage in unsecured money market transactions. Transactions may be conducted overnight, on a rolling basis or for tenors up to one year. The ESM may also issue commercial paper, money market promissory notes and engage in repo transactions. In addition, the ESM has established liquidity lines with the DMOs of ESM members and a network of credit lines with private banks. The EFSF applies capital market and money market instruments. Capital market tools include benchmark bonds with maturities ranging from 1 to 30 years. The EFSF may hold its own bonds for a limited amount, so that additional funding may be raised by selling the bonds on the secondary market or by using them as collateral in the secured money market. Who are the main investors in ESM and EFSF securities? Investors in ESM and EFSF securities are mainly institutional investors such as commercial and central banks, pension funds, sovereign wealth funds, asset managers, and insurance companies. How do the ESM and EFSF issue bonds? ESM and EFSF bond issuance is conducted via syndications, auctions, private placements or taps of existing lines. Which banks can act as lead managers for bond syndications? The lead managers are mandated from international institutions that make up the ESM/EFSF Market Group. The lead managers are chosen following a rigorous and transparent selection process. What is the risk weighting of securities issued by the ESM and EFSF? The Basel Committee on Banking Supervision announced on 18 March 2014 that securities issued by the ESM and EFSF are to be designated as Level I high quality liquid assets under Basel III - Liquidity Coverage Ratio. As a result, securities issued by both institutions have been assigned a 0% risk weight under the Basel II Standardised Approach for Credit Risk. The 0% risk weight for ESM and EFSF securities is also stated in the Capital Requirements Regulation (CRR), which together with the Capital Requirements Directive (CRD IV), implement the Basel Committee’s recommendations into EU law and national law, respectively. For previous FAQs please visit our archive.